Illustration courtesy of Columbia River Knife & Tool, Inc. 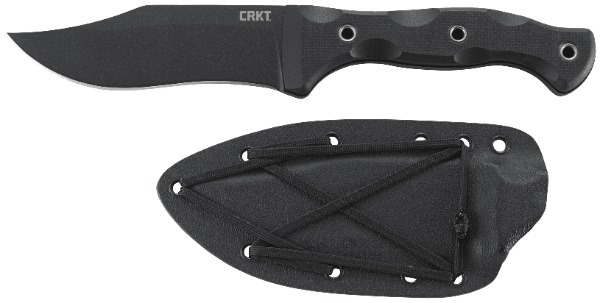 The Rakkasan is part of the CRKT Forged By War program. Austin McGlaun of Columbus, Georgia designed this knife for his fellow veterans, including those still fighting the battles to keep our nation free. Rakkasan is the Japanese translation of "umbrella for falling" (parachute). Jim carried a Randall fighting knife in Vietnam. After seeing this blade he remarked that it would have been the perfect backup and last resort. That is pretty high praise coming from a man who loved his Randall. He will not part with the sample Rakkasan with which CRKT provided us for this review. Do not get the idea that the Rakkasan is only good for last resort defensive situations. It is just as at home on your belt during an excursion into the field, where it can serve as a utility knife. The design makes it a multi-purpose belt knife. The Rakkasan blade is fabricated from SK-5 steel, a moderately high carbon Japanese steel. It is their equivalent of American 1080, which is considered a good steel for beginning knife makers to learn on. SK-5, 1080 and 1095 carbon steels are used in survival/tactical knives. SK-5 and 1080 are also used in hand tools, such as wood chisels and saw blades. Properly heat treated SK-5 blades are very tough, hold their edge well and can be used to cut through just about anything that a knife can be called upon to cut. SK-5 is easy to sharpen and can be given a wicked edge. Corrosion resistance is poor. CRKT gives this blade a black powder coat finish to help delay rusting. The blade shape has a pronounced clip point and an equally pronounced recurve in the cutting edge. The latter makes it basically impossible to sharpen this blade on a conventional whet stone. Sharpen on crock sticks, such as the previously reviewed Lansky Master's Edge. The black G10 handle scales are secured to a full tang by three large, hollow rivets. The scales are slab-sided, checkered and feature three large finger divots on the top and bottom of each panel. Unusual for a fighting knife, the Rakkasan lacks a double hilt (or even a single hilt!) to keep an opponent's blade from sliding down the Rakkasan's blade and cutting your fingers off. However, the shape of the handle by itself should at least serve to keep your hand from sliding onto the Rakkasan's blade. The Rakkasan comes with a Kydex sheath with a length of paracord threaded through the hollow rivets that hold the two haves of the Kydex sheath together. The knife is retained in the sheath by friction. The sheath attaches to a belt by means of a clip. The Rakkasan is covered by the CRKT lifetime warranty against defects in materials and workmanship to the original purchaser. As with all of the tools in the Forged By War program, CRKT donates 10 percent of the net profits to the charity of the veteran maker's choice. Copyright 2018 by Mary and Jim Clary and/or chuckhawks.com. All rights reserved.